In an effort to make available to all our members, the Association’s newsletter, DEDICATED DECADES, in a form that is simple and easily read, we are going to prepare a weekly newsflash with these inspirational articles and news from our members all over the world. We pray, this will be the fire to keep our devotion burning brightly, and the glue that will hold us all together. Please, we long for any news you may wish to share about the blessings of this work in your life and the miracles that St. Philomena has obtained for you and your family. The principal Dogmas of our Faith are from Mary, in Mary, with Mary, and through Mary. Looking at Mary these Dogmas are read, embraced, loved and believed. She contained and contains the Gospel which she offers to us all through the Mysteries of the most Holy Rosary. Mary is the direct way to Christ and the weapon of conquest with which to establish the reign of Jesus Christ universally. It is a privilege to pray faithfully our Daily Decade and recruit as many souls as possible to practice this devotion for the defense of Holy Mother the Church. We are the soldiers of Mary Immaculate, whose courage in following her Son to the foot of the Cross of Calvary has never been excelled. We are called to be firm of mind and purpose, to cast aside vain fear, and to summon all our powers and resources in order to achieve the Triumph of her Immaculate Heart! We must never yield to the spirit of the world, to the suggestions of the powers of evil, to human respect, timidity or tepidity. With the help of the Immaculate, we will meet frustration with resiliency, tepidity with ardor, faint heartedness with fearlessness, discouragement with fortitude, and cowardliness with great courage! 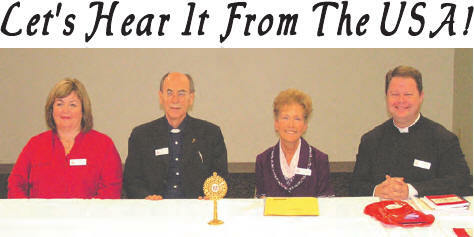 The Living Rosary is a closely-knit Association. More than twelve million people are united in one purpose. Every member in the world is connected with every other member. All are united into one; all are connected through the breath of charity. Life flows through these connections from the Heart to even the smallest group, or single member living in the most remote area in the world. There is a ceaseless flowing of Grace in every direction. Ideally, all the members should be familiar with the work of the whole Association. Routine and apathy will not enter in where there is a lively interest in the progress of the Association everywhere in the world. Obedience will be made so much easier if we can see the army at work as a whole. The bi-annual newsletters are not an extravagance or wasted effort. Through the DEDICATED DECADES we can see the life of the movement rather than the qualities of the individual members. The newsletter Is vital to the loyalty, respect, support and unity of the Association. We must make every effort to see that the newsletter reaches all members. It is our “GIFT” to each associate and a great insurance that he will continue to pray and remain in union with the Heart of the apostolate. Apathy and the spirit of Mary are contradictory. Mary could never be anything but enthusiastic in the love of virtue and the battle against sin. We must remember that we are not alone. We work for God in union with Mary. And, oh, how she longs for the success of our work!!! She is the Virgin Most Powerful. We must believe in her and never forget that, through her prayers, we have at our disposal nothing less than the all-powerfulness of her Divine Son. The more difficult the circumstances under which we have to work, the more indelibly is the Cross imprinted upon our work. The Cross is always the Sign of Hope!!! Where did she whom God loved more than all His other creatures find herself? At the foot of the Cross, with her soul pierced by a seven-fold sword and on her head the mystic crown of Queen of Martyrs! Each and every associate is united in their desire and prayer to bring about the Triumph of the Immaculate Heart of Mary through the propagation of the Holy Rosary and the Brown Scapular. Mary exists to bring Christ to the world. True union, TRUE DEVOTION to Mary, cannot be separated from apostleship. United with Mary, we will mother souls. How our Sorrowful and Immaculate Mother gazes upon the masses of the human race today, with longing and love: upon the followers of her Son who are so self-centered, so apathetic, so lacking in zeal; upon the wealthy materialists, upon the hundreds of millions of pagans; upon those who make war on the very idea of religion. Never was, or has there been, a greater need for a bold apostolate. Our privilege and duty as Christians demand that we take an active part in such an apostolate. At every moment we are dependent upon Mary for Grace. This grace is the very life of our souls. Without it, we cannot breathe spiritually and we will perish. Let us, then, with all zeal, no matter what sacrifice is required, bring the Immaculate Heart of Mary to souls that they may have LIFE. Saint Philomena is the New Light of the Church Militant and how badly we need her heroic charity, humility, purity and obedience to all that is the Will of God. May God and His Blessed Mother be with you in everything that you do … ALWAYS and FOREVER! I am very sorry to be so lax in sending you something to help. Thank you with all my heart for the Mass you had offered for our family. Let me share a bit about my mother, bear with me. In the late 1930’s, she worked in a laundry and ironed 500 shirts in a day at 15 cents a shirt. She married at 19 years of age. When she began having children, her teeth simply crumbled in her mouth and each one had to be pulled out. She had 4 children, no car and no insurance. When I was in the 2nd grade, my mom had breast cancer. The treatment then was to put acid on the cancer and burn it off. They let it burn too deep and it ate into her artery. She nearly bled to death. After this, mom had migraine headaches for years and suffered with varicose veins, herniated discs, arthritis and cancer of her female organs. 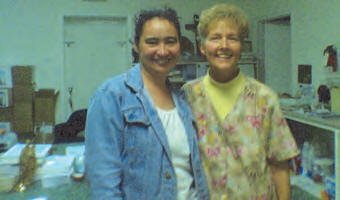 She now has many deep lesions from the surgeries which were causing her great pain. I told her about the holy oil. I give St. Philomena credit for prayers answered. I talked with mom the other day and she said all the pain is gone! Mom is not Catholic, but her faith in God and miracles is very strong. Through all her suffering, she has never complained, never gotten angry at God and never told others about her suffering. I love my mom so much. I am so proud of her! For years, I had not heard from my father. 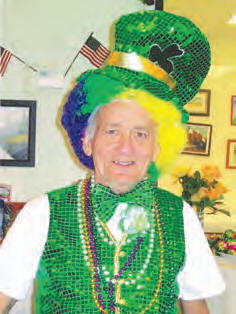 His wife got cancer and he gave me power of attorney of his home in NY. Time passed. Then, a friend was going to a wedding in Florida and she promised to stop and visit him and send me a photo. I could see that his circumstances were dire. I flew down to visit him. I was shocked at his physical condition and his environment. I could not persuade him to come back to NY with me. The last thing I did, without much hope, was to give my father a Green Scapular. Later, I quit my job and went to Florida to be near my dad. I took care of his paper work, cleaned his house and tried to persuade him to get his life in order. But, he continued unchanged as he had no need of God. I felt very comfortable about what I was doing because I saw that my dad was wearing the Green Scapular around his neck! Our Lady was at work! I had to return home. After a short while, I got a call from my father’s doctor and he told me that he did not expect my dad to live. My daughter and I flew down. In the midst of the worst scandal in the Church’s history, God sent me four holy priests. Dad was registered at the local parish, Most Holy Name of Jesus. He accepted the grace to go to Confession. He received the Sacrament of Extreme Unction. Father Tobin gave my dad an Apostolic Blessing and he died peacefully. Dad had a beautiful Funeral Mass and burial, with full military honors at the National Cemetery in Sarasota. Our Lady keeps her promise for those who wear the Green Scapular. My daughter, Chloe, has found her calling. 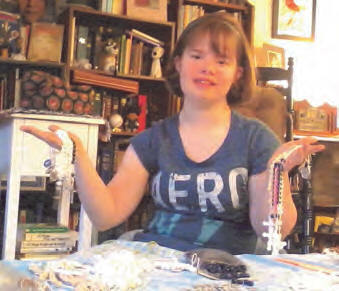 She is so happy you like the Sacrifice Beads of St. Theresa she is making. I am on my way right now to mail you the Good Deed beads that she made for you. She used all the items you sent, plus went ahead and used the mission plastic Crucifixes and the Miraculous Medals. Thank you for giving her this awesome opportunity! This past January, my husband had emergency open-heart surgery and he suffered many grave complications. A religious Sister at our parish introduced me to St. Philomena and gave me a 2nd class relic of her. I began praying to her every day. Then, your Dedicated Decade magazine was placed on my windshield on Sunday at Mass but no one knew who put it there. I am grateful to this secret promoter and we would like to obtain other devotional items to assist us and promote her devotion. We are doing much better here and have grown to love the Saint. Thank you so much for sending the booklets for Consecration, “To Jesus, through Mary.” The children are making good use of them. Thank you for sending the books and Sacramentals to me. Just knowing someone cares is a true blessing in itself. I don’t know if my body will be healed, but my soul is filled with joy and hope. I have been set free from sin and death! God bless you and your workers. Thank you for your love. I am currently serving time in the Buckingham Prison and the Rosary has been a great comfort to me. It has helped me overcome many problems. In the beginning, before I converted to the Roman Catholic Faith, I did not understand the need or use of the Rosary, but I prayed it anyway and it worked! I am a lot calmer, my worldly thoughts and sins are much less. I live like a monk and would like to dedicate my life to God. Father Kelly is our chaplain here. He is a nice older Irish priest. You are in my prayers. Here is Manuela from Belize. We had the marvelous opportunity to meet and visit with Manuela who is a great Rosarian for the schools and poor villages in her country. She was in Houston for a seminar and medical evaluation. Three years ago, her foot was crushed in a car accident. She will be going for her fourth surgery this month. She will be taking a leading role for the Living Rosary in Belize. Her mission began by invitation. Manuela had lost her car keys. She had looked everywhere for them. Then, a friend told her about St. Anthony. She did not know of him, but after he insisted, she prayed, ‚OK, St. Anthony, if you are there, please help me find my keys.‛ She began looking all over again, in the places she had already looked. She did not see them at first because there was a Rosary on the table covering them. A Rosary that had not been there minutes before. She picked up the Rosary and under it were her keys; then she heard a distinct voice say, ‚The Rosary is the Key to Heaven!‛ From that day forward, Our Lady has showed her ways to spread the Rosary and it is her great mission today. Her visit to us was a window opened by the Queen of Heaven. I have been wearing my Medal on a chain around my neck for over a year now and it has transformed my life! I am not so anxious, am much healthier and I don’t get so angry or dwell on the past. I want to ask everyone to pray for my son, Andrew John, who is near despair. He carries many heavy crosses. God love you! I am distressed over the Post Office debacle and the fact we are struggling financially. I was surprised to hear about a move to a new location. Our Association will recover and thrive, as we are under the protection of Our Heavenly Mother and St. Philomena. I will be praying for you all. Please use my small offering for your expenses. I want to say, ‘Thank You’ for all the work you do for souls through this special Apostolate. I hope my donation helps. The daily Rosary is part of our family’s prayer life. It is because of your encouragement that we stay committed to this wonderful prayer. I have seven children and seven grandchildren. They all practice the Faith and we pray that the Rosary will be a vital part of their daily lives because it is so important. I believe it has protected us from so much seen and unseen danger in this great spiritual battle we are all currently living. Like so many others, it feels like we are just hanging on by a thread, but the Rosary is the glue that holds us together with each other and with our Catholic Faith. I love how you honor St. Philomena and St. Therese. Thank you for your ‘YES.’ < Patti – WA > Things are better here. My son was released from the hospital and is working as a math teacher for a holy priest in a small Catholic school; me and my husband are healing. I am proud to be a part of this beautiful work of God, to be a link in this prayer chain has given me so much emotional and spiritual help. I use to think that God had big plans for me as a worker in His Church, but now I know that I am just an ‚old broom in a closet‛ and that is OK with me. I just want what God wants! Thank you for all your encouragement. You have won me over with your example of kindness and generosity, inspired by the love of God. I wil l certainly benefit to join you by taking up a Decade of the Living Rosary. In the Resurrection, Christ shows that He conquers weakness, sin, vice and death. It demonstrates to me, again and again, the power of God to save me from all my trials and, particularly, from my own wickedness. I am waiting for my Decade. Thank you so much for the beautiful Dedicated Decades booklet. It is not only a work of art, but a treasury of the Catholic Faith. It is amazing how you do all this. May God continue to bless you! You are the connection through which we can all be helped. I thank God your apostolate came my way. I am grateful to be a part of the ULRA. Demonic activity today is escalating and our giving must be sacrificial while our prayer must be unceasing. “Woman hit by truck!” While crossing the street, Jean was hit by a truck, breaking both bones in her left arm. She told the reporter that God was in the intersection with her or she might have been killed. Jean sows Scapulars and strings Miraculous Medals for our missionaries. I was bitten by a brown recluse spider twice at the same time. Very dangerous! I made a promise to Our Holy Mother that, if she would heal me, I would help spread her devotion. Well, I am ashamed to say I had forgotten that promise, but Mary did not! When I was reading through your magazine, I remembered my promise and decided to help string Miraculous Medals. When you sent the 2nd box, I knew it was our dear Lady who wanted me to do this. I can’t speak well and don’t have any other talents to offer others, but I have ten fingers and my evenings have been greatly blessed by helping with this apostolic work. You have no idea how you have helped me feel that my life isn’t useless. Thank you, dear Mary! This entry was posted on Thursday, November 3rd, 2011 at 8:24 pm and is filed under NewsFlash. You can follow any responses to this entry through the RSS 2.0 feed. Both comments and pings are currently closed.